Kratie (ក្រចេះ, pronounced kra-chey) is a tiny town in northeastern Cambodia. Despite its small size, it is the capital of the province of the same name. Kratie is one of the four provinces in northeastern Cambodia, and although it is relatively remote and not heavily visited, travelling here won't earn you points if your priority is to be a pioneer. There's no large scale tourism, but plenty of backpackers pour through here during the peak season. The town has developed to meet this demand, with very good budget accommodation that is well known in backpacking circles. The province is heavily rural, so be mindful of yourself and your behaviour. Do not add to the already overwhelming amount of litter and discarded rubbish visible in and around the town, and be mindful of local norms in dress sense, so don't go swimming in a bikini. From Kampong Cham (to the south) the road is in good repair. From Stung Treng (to the north) the road is sealed, but has fallen into disrepair and the journey can be uncomfortable and slow. If headed into Laos, visas on arrival are obtainable at the Lao border. The bus/truck station is in the northwest part of town. Buses from Stung Treng take about 3 hours. As with all forms of transport in Cambodia, get your bus ticket early, and show up even earlier to ensure you get a good seat, as buses will fill up fast as soon as they let people board. With the improving road conditions, bus services have improved and there are now a number of options between Stung Treng and Phnom Penh. There are daily buses from Siem Reap to Kratie. They leave at 07:00 and cost USD10. You will have to switch buses half way through this journey at Skuon or Suong. Share-taxis and minivans serving Phnom Penh (4-5 hr), Stung Treng (2 hr), Kampong Cham (2 hr), Ban Lung (4 hr), Sen Monorom (4 hr), and a number of other small towns go from the taxi stand a block north of the market. Prices to Phnom Penh and Stung Treng are about 20,000 riel per seat. These are much faster than the large commercially operated buses and comparably priced, though slightly less comfortable. Purchase an extra seat or share 3 between 2 of you for comfort. From Phnom Penh or Kampong Cham share-taxis and minivans can save several hours buy taking a road directly south of Kratie that most of the commercial bus companies do not use and bypassing Snuol. Trucks arrive from various neighbouring towns and provinces but you have to weigh the benefits and drawbacks of this form of transport carefully. They are less safe and often slower than buses, as well as being more expensive. The one (potentially) overriding positive is that riding in a truck you get the chance to have a much closer connection with local Khmers than if you were riding in a tourist bus, particularly as you'd be surprised how many Khmers in the provincial capitals are somewhat proficient in English. Expect to wait a couple of hours for the truck to fill up, assuming you're the first one there. With the improvement of the roads, ferry services along the Mekong River from Kampong Cham no longer run. If you are feeling adventurous, you might find a rice-barge on its way north from Kampong Cham. As the town is so small, ignore offers from touts to take you from the bus stop into town, since it's a walk of just a few minutes. If you feel compelled to hire a motodop to take you anywhere within town, you won't need to pay anything more than 500 riel for your short journey. To visit sites outside the town, you'll need to hire a motodop for a few dollars - standard prices are posted around the guesthouses, typically USD3-5 depending how far and how long you go for. Bicycles are by far the best way to get around Kratie and enjoy the town at your own pace. Most guesthouses will organize you one, but they usually all come from the same shop - from the front of the market head south until the street ends across from the Ministry of Water Resources. On the corner there bikes can be rented from a lovely Khmer family for USD1 or 4,000 riel per day. Easy to spot this shop - look for all the bikes! Motorbike rentals are available at just about any guesthouse. A 110cc Honda step through bike for USD6 per day. Given the tiny size of the town, you won't need one to do anything within Kratie, and the roads outside Kratie aren't in great shape, but it can be a great way to look around the country side a bit further afield. Basket weaver villages (15 km south of Kratie). There are 3 basket weaver villages near Kratie. The biggest is the Cham village Chheu Teil Ploch with 4,000 villagers. Concrete Animals, All around town. Spot cranes, rhinos, deer, and even elephants in Kratie. Concrete, sadly, but melancholy reminder of the wealth of creatures that once roamed the local area. Free!. Ministry of Culture and Fine Arts (downtown north Kratie). Here you can sometimes catch a musical performance. Groups sometimes come to perform singing contests here, with both traditional Cambodian instruments and Western. Otherwise, nothing else to really see here. Located by the river by the northern roundabout. Phnom Sombok (10 km north of Kratie on a prominent hill). A rather nifty temple north of town and situated on the only hill anywhere near Kratie. A long set of steps lead to a pavilion, the interior of which is painted with torture scenes, depictions of what happens to those not virtuous enough to lead a holy and clean lifestyle. Makes a good stop on the way back to or from the dolphins. As a little bonus you might catch a glimpse of the family of monkeys that lives around the temple. Free, but visitors are encouraged to leave a donation for upkeep of the temples. Sambor (about 40 km from Kratie). This is a pre-Angkorian era settlement. The temples, among which is Wat Sorsor Muoy Roi (temple of 100 columns) contain several colourful murals that tell legends of nature, and other traditional Buddhist stories. The original structure is no longer standing, in its place is a reconstructed temple. Town Museum (At the north end of the main town near the globe roundabout). This place is almost never open. If you are really keen, go see the Culture Ministry and they might open it up for you (for an appropriate donation, say USD2) - though you'll be lucky to catch them in the office. Villages of the Mekong. There are very interesting places along the Mekong River. You enjoy your day at the villages along both sides of the Mekong river. You can go by tuk-tuk or motorbike. Basketball and Volleyball. There's a basketball and volleyball area on the south side of the old governor's residence. The security guards probably won't refuse a civil request to use it within reasonable hours, and they might even join in. Bird Watching. If you are interested in birds, when on the boat, go upstream to the islands to look for the Mekong Wagtail (Motacilla samveasnae), a Cambodian endemic species that can be found in this stretch of the river. Early morning might find them hopping on rocks near the dolphin area. Community Development Tours, Rue Sumamarit, House 695, ☎ +855 23 357230. CRDT is a local organisation which works with communities along the river and runs Community Development Tours to their projects. This gives you a unique experience of Cambodian village life, and the chance to help out with their integrated development and dolphin conservation project. Organises Mekong Discovery Trail legs (you pay a donation) and provides free information concerning the track sections in the area. 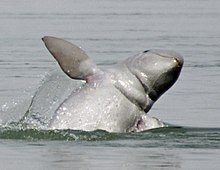 Irrawaddy Dolphin Watching (The best spot to watch the dolphins is Kampi village, 15 km north of Kratie.). There are only around 85 dolphins in the Mekong, but there is a very good chance to see some at Kampi. As river dolphins, these animals don't generally approach boats show curiosity towards tourist boats like some marine dolphins do. There is no best time of day to see the dolphins as their activity patterns don't change much over the course of the day, though it can be pleasant with the setting sun late in the day, and fiercely hot in the early afternoon. The dry season offers generally better opportunities to see groups together and spectacular behaviour (rare though it is), and in wet season the boat trip is considerably longer as the animals move several kilometres upstream from the tourist site. To protect the dolphins, you should ensure that your boatmen follows the dolphin watching guidelines provided and only use oars when near the dolphins. There's also a nice little shop which does benefit the community and helps encourage the villagers conserve the remaining dolphins. By motodop, this trip should be around USD2-4 for the round trip, about 20 min each way. Or rent a motorbike for USD5. Cycling to this spot should take about 60 min, bicycles are available for rent in Kratie and cost about 5,000 riel a day. USD9/person, USD7 for 3 or more. Includes a boat trip. If you just want to sit on the bank and watch the dolphins, you still have to pay the same. This is a set government charge. When planning to do the Mekong Discovery Trail, keep in mind, that you can also see dolphins from Koh Rougniv Island, which nicely combines with a home stay in Koh Phdau. You get a private, and romantic sunset tour for USD7 per boat, no other tourists in sight. Mekong Discovery Trail. The Mekong Discovery Trail takes you into the heart of the Mekong where the beauty of the river and the friendliness of the people create unforgettable river life experiences in northeast Cambodia. The Mekong Discovery Trail is a network of safe, eco-tourism journeys through some of the most natural and least populated parts of the Mekong. The free trail guide (e.g. Community Development Tours) provides maps, transport and accommodation options. You can travel on a small part of the trail, or all of it. You can travel alone or with a group. There are many options along the 180 km trail, which runs between Kratie and the Cambodian/Laos border. But remember to allow enough time to go with the flow of river life. Along the trail, you will have the opportunity to see critically endangered Mekong River Dolphins, while minimising your impact on them and the habitats they rely on. By using the Trail, you will also be assisting river communities, some of the poorest, but most welcoming, in Cambodia. Sorya Kayaking Adventures, 234 Preah Sihanouk, Kratie, Cambodia (behind Balcony Guesthouse, one street back from the riverfront), ☎ +855 90 241148. Go kayaking along the Te River or Mekong River near the town of Kratie. Half-day, one day, and overnight trips are available at reasonable prices. Along the river you can see dolphins, many unique bird species, forest, villages, cropland, and Vietnamese floating villages. If you participate in the overnight trip, you can enjoy a peaceful home stay along the Te River. Acleda Bank (Road 12, near the north end of the market). This branch can change US dollars and Thai baht only. They can also cash travellers cheques. The ATM only accepts Acleda ATM cards and Visa cards. A more expensive option for funds, but saves a 3-4 hr trip to Kampong Cham. Barber Shop (On the road near the Mekong Restaurant). Till 20:00. They will always use new razor blades, but the towels are not the most hygienic. 2,000 riel for a shave, 2,500 riel for a standard cut or 4,000 riel for both..
Canadia Bank (On the riverside north of the centre of town). Bank branch and ATM. This ATM charges less than the Aceleda Bank, and accepts Maestro, Cirrus, Visa and MasterCard. CEDAC Shop (on the river front near Heng Heng guesthouse). Range of local handicrafts and products such as honey, local juices, rice, handmade hats. CEDAC is run by a local NGO and profits go towards their rural development products. Market (along the main road at the centre of town). Find the standard assortment of local foods, fruits and meats, as well as a small variety of handicrafts. Remember your bargaining skills and etiquette when here. Money Changers (Available throughout the town, particularly in and around the markets). Look out for packets of money on display. Some guesthouses can also change money. They will give you in general a slightly better rate than the bank but you have to ask around for the best deal. Some of them do also change other currencies than dollars such as Thai baht, Vietnamese dong, and Myanmar kyat. Occasionally, other western currencies are changed as well but expect a poor rate. It is possible to change Lao kip but you are better off changing kip to dollars before leaving Lao. Balcony Guesthouse usually offers the best rate for kip, though still low. Eating at small food stalls offers a cheap alternative to restaurants, with fried noodles available, chicken rice porridge, foetal duck eggs and others. Servings are generally smaller than in nearby restaurants. The riverfront night market has been moved to the road out to PP. Follow the riverfront and keep going when it turns inland. Mekong Restaurant. Typical Khmer food including staples such as of fried rice, grilled chicken, and rather tasty French fries. USD1-2. Red Sun Falling (On the waterfront opposite the port building/bus stop). A backpacker staple with good food and drinks, and the expat touch. Prices are reasonable, but not as cheap as the nearby Khmer food. Service can be slow, but what's the hurry? The Red Sun Falling also has a good selection of books for sale, which you can browse while you wait. There is a new owner, Joe's right hand for many years, who is carrying on with the books and food as usual without the grumpiness. However, Joe's specials will be missed, as well as his famous St Valentines parties. Free Wi-Fi. The Thea Sdav Restaurant (Near Wat Ou Ruessei). Students eat here early in the morning rice with meat and vegetables or a soup before they go to school. Seasonal and daily menu of typical Khmer food including BBQ, Khmer salads, eggs and soups, home made prahok, freshly made fruit juices, ice cream and Khmer herbal spirits. USD0.50-2. Watching the sun go down over the Mekong, with a cold beer or a tuk-a-lok (fruit shake) on the river front, is one of the joys of a visit to Kratie. There are many stalls which set up in the late afternoon to service that need (and stay open until midnight, unusually late for a Cambodian provincial town). Red Sun Falling will stay open until the last person leaves, which can be pretty late, and the new Marlees Bar offers the other bar option in town. Heng Heng Hotel, Rue Sumamarit, ☎ +855 72 971405. Now offers river front rooms of very good quality (especially at the Heng Heng 2), if slightly pricier than other options in town. This place has been upgrading itself significantly over the past few years, and now has hot running water. Tasty Khmer food at reasonable speed and price per dish USD1-2.50. Khmer breakfast also OK with a Western option of omelette and bread for USD1. Wi-Fi downstairs. Singles USD10, doubles USD15. Oudom Sambath Hotel, Rue Sumamarit, ☎ +855 72 971502. Probably the best hotel in town, and some of the top-floor rooms offer good views of the Mekong. Owned by a local general (in his wife's name), whose official government salary is about USD38/month; the opulence of the timber decorating the place might suggest where the money came from for this substantial investment. Service can be a bit on the low side - toilet paper not provided even on repeated request ("I don't care"). Has Wi-Fi in most rooms. Singles USD8, doubles USD15 (goes down to USD7 in low season). Santepheap Hotel, Rue Sumamarit, ☎ +855 72 971537. This has long been considered the standard choice for tour groups, and has a small restaurant. Rooms come with hot running water, but the bathrooms are generally dirty, and some cable channels for your viewing pleasure (even though you probably didn't come to Kratie to watch TV). Wi-Fi in reception. Singles USD7, doubles USD15. Star Guesthouse, ☎ +855 72 971663, +855 72 753401. Check-out: 12:00. Has been elevated by tourist and guidebook alike to the status of best in town, but this is debatable. It often gets the lion's share of backpackers during the busy parts of the year. The rooms are OK, and the staff speak some English, and can offer local travel tips for you. Wi-Fi downstairs. Restaurant on the expensive side, it has an uninspiring selection of Western and Khmer cuisine. Singles/twin USD4, doubles USD5; larger rooms cost USD2 more. You Hong Guesthouse (Opposite the north entrance to the market). Has close links to many transport options and you may find yourself dropped off there. Basic rooms (fan or air-con - directly above the bar), and is popular with budget travellers. The Internet service is a good feature (but expensive, and you don't have to stay there to use it). The atmosphere out front is about as bustling as Kratie gets. Restaurant average. Has an impressive menu, but only cook some of it well. Pizza is unexpectedly good. USD7-15. Banlung - This town is near spectacular natural attractions, including waterfalls, volcanic lakes and natural parks, and hill tribe villages. Chlong - A small town, about 30 km from Kratie. Kampong Cham - the third largest city in Cambodia, full of colonial charm. Stung Treng - The town most tourists pass through on the way to Laos. This city travel guide to Kratie is a usable article. It has information on how to get there and on restaurants and hotels. An adventurous person could use this article, but please feel free to improve it by editing the page. This travel guide page was last edited at 06:40, on 6 March 2019 by Wikivoyage user Ground Zero. Based on work by Wikivoyage users Traveler100bot, Andrewssi2, ShakespeareFan00, Traveler100, Ikan Kekek, Dancarmon, Dan Koehl and Hippietrail, Wikivoyage anonymous user 110.74.221.156 and others.